The Wider World perceives fashion as a frivolity that should be done away with. The point is that fashion is the armour to survive the reality of every day life. I don’t think you could do away with it. It would be like doing away with civilization. Fashion as the armour to survive the reality of every day life. I have worked in fashion for about five or six years and part of my experience of it was Bill Cunningham’s ‘On the street’ reviews of the fashion being worn on the streets of New York City. 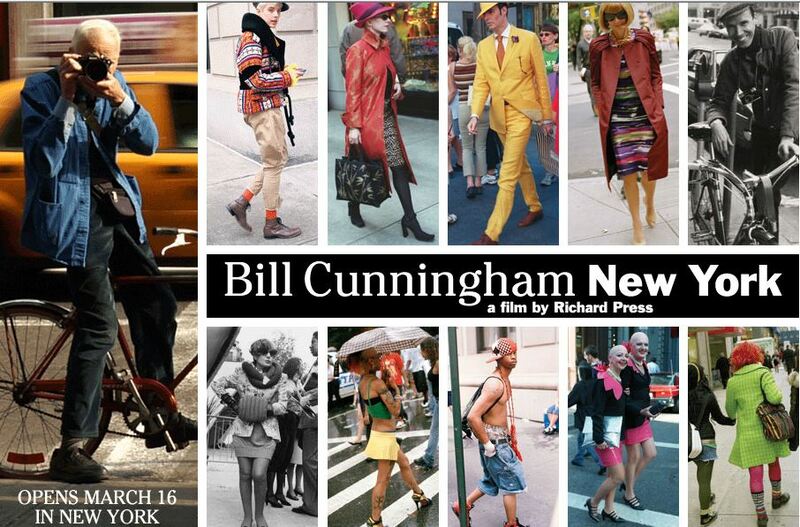 Of course, I didn’t really know who Bill Cunningham is. I just knew that was the place to go to keep my finger on the pulse. I have an uneasy relationship with fashion. As a woman I both love and resent it. I have owned truly great pieces of clothing and there is an aspect of self hood that is able to be denied when you don a very beautiful piece of clothing. By beautiful I mean a work of art created b an artist. Yes there is the superficial feeling of inclusion, but there is also an experience of a lack of self consciousness. We all feel uneasy when we venture out into the public gaze. When you wear a pair of Chanel boots, you feel sufficiently hidden behind the beauty. It’s not about you, it’s about the clothes. A mantra Bill sings throughout the film. Fashion does have a lot to do with hiding. And death. And burial. Images are not necessarily of celebrities, as much as they are of ordinary people wearing clothing well. He loves older glamorous women and he won’t take a picture of a famous woman if she doesn’t look interesting enough. The more avant guard the better. He wants style, not just ‘clean’. He is incredibly kind. He takes flattering images of women, and refuses to use images that are not good enough. Bill loves fashion because fashion has a place for eccentricity and he loves to celebrate eccentricity. He claims he us not a paparazzi photographer and never could be. He also claims this is not about the photography, it is about the subject. He is a chronicler of connections – he takes photos of people and what they are wearing at social events and this results in still images of how all the wheeling and dealing in New York City is done. He is a man who uses his job to remain on the periphery of the society he so loves and admires. The film started to get very interesting for me around half way through. Suddenly, all these people who profess to love him are filmed saying they know nothing about him. Speculation is made about his solitary life, strange living conditions and eccentric style of dress (very interesting that Bill – on the other side of the camera – couldn’t be more invisible in his chosen style of dress.) He has very few clothes (all hanging on the outside of file cabinets) and tapes up tears his ‘disposable’ wet weather poncho, as he gleefully giggles that it embarrasses people that he keeps wearing it. He won’t pay more than $2.50 for a coffee. He eats out all the time, but refuses to accept even a glass of water at the functions he attends because he feels it will compromise his extremely precious artistic independence. He is an intensely private man, using the camera (as so many photographers do) to create a barrier between him and world. The film got even more interesting when the mirror of fashion was turned back upon Bill. Bill is interested in people who act and look completely differently to him. What makes that particularly interesting is he has access to their lifestyle. In a profoundly ignorant comment, one woman claims Bill must have come from the upper echelons of society because only a person from that walk of life would choose to go without creature comforts as Bill has done. Actually, Bill is from a very middle class average family (and lets face it there is far less chance of the very rich chosing to go without than poor) who he claims don’t think fashion is a very ‘manly’ career choice for their son and sibling. What we are told several times is that Bill is a Catholic and we find out he attends church every Sunday as a committed part of a routine. We never see a shot of this, presumably because Bill refuses access to that. Bill also claims on camera that he is not gay, has never been in a relationship, although he as “the natural urges.” When asked about why he has no relationship, he replies, there was no time. Work takes up all my time. When asked about his religion, a long pause ensues where Bill is looking down into his lap. This moment is so excruciating, the interviewer suggests he can refuse to answer the question. Bill looks up and we know he has been crying. For a few moments he fumbles around with saying nothing then the trademark smile is back, and the audience melts in the palm of his hand again. But that moment is very telling. Also, the pace Bill keeps has a story behind it. Bill is now 82 and working as hard as he ever did. His life is monastic as only the child of Catholic parents life can be. Bill denies himself, in every conceivable way, then goes to church to confess. When asked about the obvious differences between himself and the people he photographs he claims what other people do doesn’t concern him, he’s interested in their extravagance. He claims, he who seeks beauty, will find it. Fashion is the game of facade. It is the target of countless barbs because it is concerned with the most outer layer of what it is to be. It is the very definition of surface level. This is even more surface level than our physical manifestation of self. That being said, absolutely everyone who wears clothes concerns themselves with fashion. You are either into it (a fashion follower), or not into it (the same thing – a person who likes to be seen to not be into it) or you use it to sloganise (t-shirts) or establish yourself as part of a clique or cult. It is the fetishization of self awareness. There is no one who wears clothes who is immune to its effects. It is the ultimate in superficial as it is the ultimate disguise. And here is a man devoting himself as a priest, to the goddess of fashion. He is self-effacing to the point of self-indifference, he never buys anything, including groceries. As we feel about Priests, we feel about Bill. We assume it is wisdom and genius behind these decisions, not-self denial and a winning formula that allows him to get by in life. Bill is still playing cute at 82 and the world of fashion where almost everyone is a competitor adores him as long as he promises to stay that way. (If people REALLY admired him, they wold be seeking to emulate his life style). Bill, a man who recognises and admires eccentricity, is completely aware that he must be an eccentric himself. The state Bill achieves is basically ‘normal’. However he claims at one point in the film it is very difficult to live in New York city and not become materialistic. So why not? He is in the ultimate game of materialism. He definitely genuinely admires the clothes. Why live like a priest and work yourself into a stupor ever night? I got the distinct feeling self loathing was at the basis of this. Here is a man who will not pause to see how he feels about himself or his life. A man who goes weekly to confess sins he can’t possibly have time to commit, whose parents show disappointment despite his monumental success because he might be accused of being gay. He refuses to touch the clothes he so admires he place his career on them, and he will not call himself any of the professional names ascribed to those talented in his field. He is a warm man-boy who is patronised by everyone, except the documentary film maker who made his film. And that’s how Bill does it. That’s how someone with that much dedication and smarts can possibly remain in fashion and kep talking about it well into their 80’s. Dont think. Do. Get up, get dressed, get to work. I wasn’t able to find much on Richard Press, the documentary film maker who made this lovely interesting film. I guess its enough to say we hear more about him. In this case the subject matter is well chosen and Richard sufficiently gets out of the way so we can properly enjoy Bill. If he is behind the questioning – I’d love to hear more on that. I’m also interested in the darker aspects of this film, and his intentions behind that. Despite this dark aspect just articulated, I did enjoy this film a lot. Bill is loveable. And he is a real character. His sweetness carry’s the film, just as it hides whatever demons he carries in his heart. And as he tells us, Fashion is the armour with which we can survive every day life. If you enjoyed this post, please consider signing up for all my updates on your RSS feed or the email opt in form. Here is an interesting interview with the film maker. Hello thank you for sharing I enjoyed reading it however, I found it to contain a quite spelling errors.